To bring anything great to life a plan has to be in place. Anyone that accomplishes anything that is amazing is a great goal setter. At MashElite we talk a lot about goal setting, and I express that all of my great athletes are great goal setters. On my podcast Weightlifting Talk (www.Spreaker.com search weightlifting talk) a lot of our listeners are people that want to succeed in life. We are constantly preaching the message of “love your life or change it”, and we celebrate people that are “black sheep” meaning people that go against the grain. To do that one needs a plan in place. I heard the great coach Lou Holtz give a lecture about goal setting back in 1997 when I was at the Olympic Training Center. His story stuck with me ever since. During Lou Holtz’s youth he was an uneducated Irishman that was working a blue collar job. I can’t really remember the job, but I think that the job was in a steel mill. Most people would go home crying, but Lou locked himself in a room and wrote down dreams. He came up with 100 dreams, and one was to be the head football coach of Notre Dame. What if he had told you his dream? Most people would have told him that he was crazy. At the time of the lecture he had already achieved 97 of the dreams. This is the process: Dream it, write it down, formulate a plan, commit it to reality, and reevaluate. I am going to do a series on goal setting over the next few weeks to help my MashEliters and The Attitude Nation to reach their dreams. 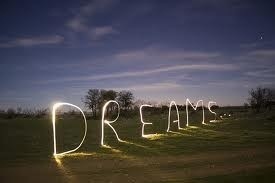 Today I am starting with “Dream It”! First you need to check your mindset. A paradigm is your view of reality. Shift that sucker up man! What I mean by that is whatever your view of reality is now shift it higher. No one becomes President of the United States without first having the Dream. No one becomes the best basketball player in the world without having the Dream. Michael Jordan had that Dream! Don’t put limits on yourself. I hear excuses all the time like: I’m not smart enough, I’m not strong enough, or I’m not tall enough. Tell Muggsy Bogues that! He was 5’3” playing in the NBA. When you find challenges in your life, those aren’t reasons not to succeed. They are points that you have identified that need to be rectified. Get to work man! What I’m trying to say is don’t have limits! Let your brain run free! Have the courage to Dream and Dream Big! God has given you one chance to be on this earth, so I say use what He has given you to bring Him the most glory. That doesn’t necessarily mean that you have to be president. Maybe you want to be the best parent in the world. That’s awesome, and should be in everyone’s list of Dreams. I’m just saying Dream Big, and do your best to achieve those Dreams! I have a lot of online clients that I train, and I write their programs. I have hundreds of athletes and adults that I work with at MashElite. I tell them all to Dream Big! Don’t set limits because those limits will definitely become the ceiling! Next week we will talk about writing your dreams down and formulating a plan.